Four species of foxes make Colorado home. The red fox lives in riparian woodland and wetlands on the plains and in forest-edge communities in the mountains. The red fox is the largest of the true foxes and the most abundant member of the Carnivora, being present across the entire Northern Hemisphere. The gray fox is found in brushy areas in canyons and along the foothills. The gray fox ranges throughout most of the southern half of North America from southern Canada to the northern part of South America. The tiny swift fox is a species of the eastern plains and its near relative, the kit fox, lives in desert shrub lands in the western valleys. Red and gray foxes are 3 feet long and weigh 9 to 11 pounds. Red foxes are reddish orange above, white below, and have a white-tipped tail and black ears and feet. Gray foxes have a black-tipped tail, reddish ears and feet and a mane of stiff black hairs on their grayish brown back. Swift and kit foxes are only 27 to 36 inches long, their tails are as long as their bodies. They weigh 4 to 7 pounds. Foxes are susceptible to many of the same ailments as domestic dogs. Rabies – is an acute, fatal encephalomyelitis caused by neurotropic viruses. It is almost always transmitted by an animal bite that inoculates the virus into wounds. Any fox bite or scratch should receive prompt local treatment by thorough cleansing of the wound with copious amounts of soap and water; this local treatment will significantly reduce the risk of rabies. Anyone who may have been exposed to rabies should be advised to always contact local health authorities immediately for advice about how to deal with their exposure and should also contact their personal physician as soon as possible. Problems associated with foxes include killing small livestock such as chickens, rabbits, and young lambs, and their potential to carry disease organisms. Small domestic animals may also be preyed on. Sometimes a fox will dig dens around residential areas, they may also dig holes under fencing or buildings to gain entry. Healthy foxes pose virtually no danger to humans. Animals that appear sick or that are acting abnormally should be avoided. The following symptoms may indicate the presence of rabies or other neurological diseases in mammals: unprovoked aggression, impaired movement, paralysis or lack of coordination, unusually friendly behavior and disorientation. 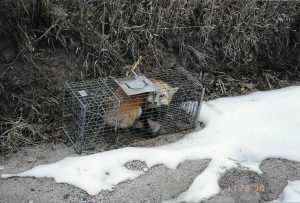 Damage control of a fox is normally done by cage, traps or snares. 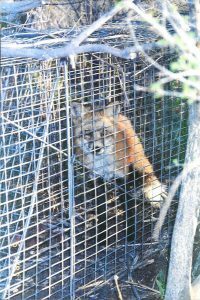 Foxes that are causing damage to your property or are threatening you or others on your property can legally be trapped. Relocation with permit only. An ADC wildlife professional can help decide what will work best for your particular wildlife damage situation.